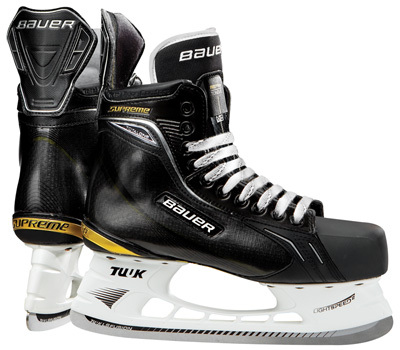 Skates- Any type of skates other than goalie skates will work just fine. Please ensure that your skates are laced with white laces. 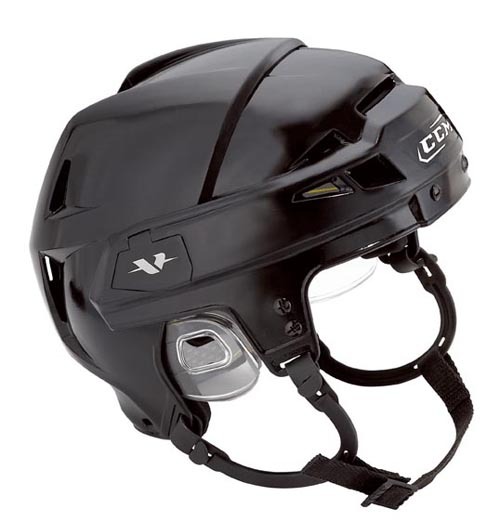 Helmet- A black CSA approved helmet is required for officiating. Before purchasing a helmet check with the sales representative to ensure that a half visor will properly fit on it. Visor- A CSA half visor is required for officiating. 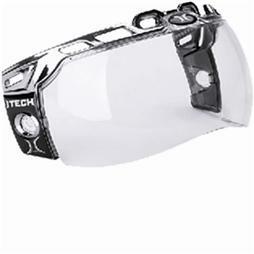 It’s often easiest to ask the salesman at the sports store you are purchasing the visor from to install it. They have a wealth of experience and knowlege. If you are just purchasing a visor it is a wise choice to bring your helmet with you to the store just to ensure it will fit properly. 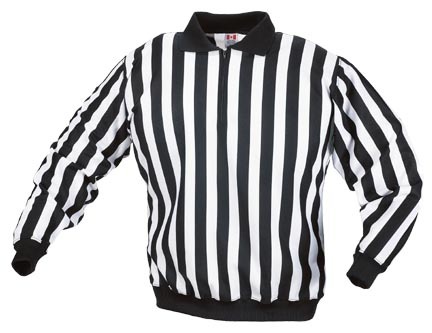 Referee Jersey- CCM is the industry leader in referee jerseys and have been proven over time to stand up the best. Ensure that the jersey has snaps on the arms. This way you can purchase "snap-on" arm bands for when you are doing 2 man or refereeing in the 3 man system. The "snap-on" bands are more functional than the elastic band style and they look a lot better. Referee Crests- When you attend your clinic the instructor will ask you if you need a crest. 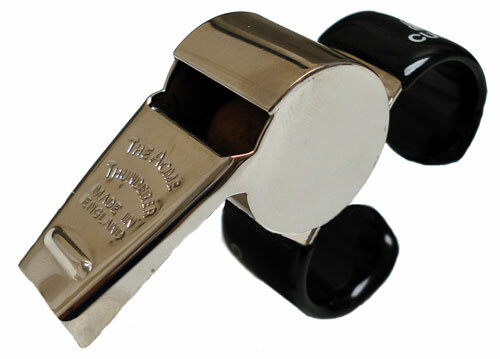 They are typically $5 and if it’s your first year refereeing you will need one. He will also ask if you would like a Hockey Canada shoulder patch. The shoulder patches aren’t required, however at $2 they provide a nice look. The Hockey Alberta crest needs to be stitched slightly above your right breast before you officiate a gmae. If you decide to buy the Hockey Canada crest if goes on your right shoulder. 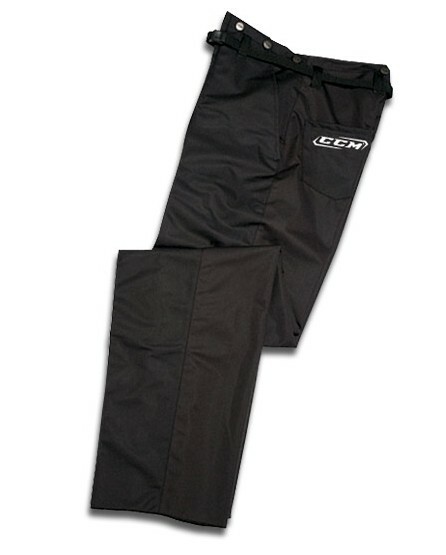 Referee Pants- If you are unsure about officiating and you don’t want to buy referee pants just yet a clean (no holes) pair of black track pants will work. However if you are interested in getting the best looking and most functional pant for refereeing you need to seriously look at the referee pant. Again the best maker of pants has proven to be CCM. Try on the pants in the store before you buy them. When hemming make sure to remember that when on skates u may want to leave the pants a little bit longer. 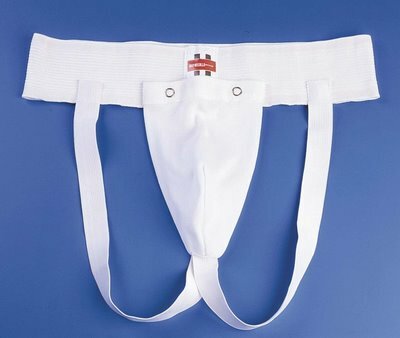 Jock Strap- Arguably the most important piece of protective equipment that a referee will put on. Very important to ensure you wear this at all levels of hockey that you officiate. Referee Shin Pads- You can wear normal "player" shin pads however you should be aware that there are special shin pads made especially for referees. The advantage of referee shin pads is they are more flexible and they have a lower profile when you compare them to players shin pads. If you do choose to wear your player shin pads you may find a difficulty in fitting them underneath your referee pants. Referee Bag- When just starting out a duffel bag will probably work just fine to carry your equipment around. However as you can see there is a decent amount of equipment that you will need to carry and referee bags are designed specifically to carry that equipment. They also tend to last longer than you’re average duffel bag. The bag pictured above is a very good bag and in addition it comes with wheels, which is a really nice feature.